2014 was an eventful year for Eli Review and Drawbridge, Eli’s parent company. Here’s a brief look back at some of the highlights of our efforts in 2014 to improve Eli as a technology and to bring better learning resources to students and teachers. In January, the Drawbridge team quietly assembled to develop a plan for the coming year, a plan focused not on dramatic new features for Eli Review, but rather on small improvements intended to improve the overall user experience, to provide more data for writing coaches, and to create new content that would help teachers everywhere grow their practice. The first stage of this plan became public in May, we were ready to release a round of user experience improvements based on feedback from our teachers and students. These improvements included a streamlined course homepage for instructors, an upgrade to the student commenting tool, and a completely overhauled Task Repository that allows instructors to search and sort their previous tasks. In July we released a second set of user experience improvements, including a new landing page for the app, new signup form, and a new look that improved performance on all devices, but especially mobile devices like phones and tablets. This release also introduced the first of our new data features, the Engagement Data tab in review reports, that provided instructors with analytic data about student performance in a single review. 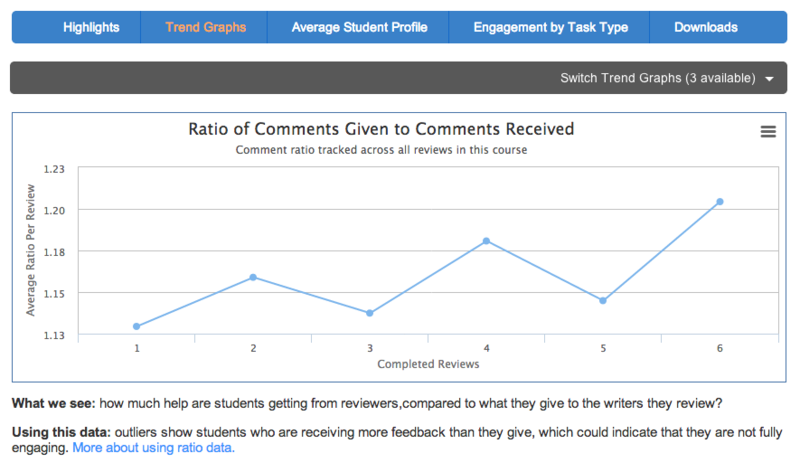 September saw the release of Eli Review’s second analytics feature, the Course Analytics report, a student engagement report allowing instructors to track student learning across a full course. Bill Hart-Davidson took the new analytics for a spin, showing how the reports offer teachers access to detailed formative feedback that allows for more responsive teaching. In October, we sent a letter to our customers and colleagues announcing that our two-year sales and marketing relationship with Bedford St. Martin’s had come to an end. This announcement marked the start of a new era for Drawbridge and the continuation of our vision for Eli Review as a means to offer world-class support for peer learning. In November, we relaunched our website and debuted our Teacher Development series, a set of research-based materials for teachers who want to learn more about peer learning and how to implement it in their own classrooms. We also released the first of our curriculum materials, built with expert teachers, that show how to get the best results from writing, review and revision and can be used in Eli Review with a single click. December brought new installments to both of our major new content efforts, with a second installment in our teacher development series about designing effective reviews and a new curriculum resource focused on coaching the moves needed for the ACT writing test. The Eli Review website has gotten better too this year, too. Not only is it the home of our new publishing ventures described above, but we are highlighting teacher success stories, and doing more blogging about writing instruction in general and using Eli effectively in particular. Our new YouTube channel has lots of great material and our Twitter and Facebook pages are busier than ever. These are all great resources for TA training, faculty brownbags, or other presentations! 2015 is already shaping up to be another great, productive year. More teacher development installments are in development, more curriculum materials will be available soon, and we have some exciting new features on the drawing board. 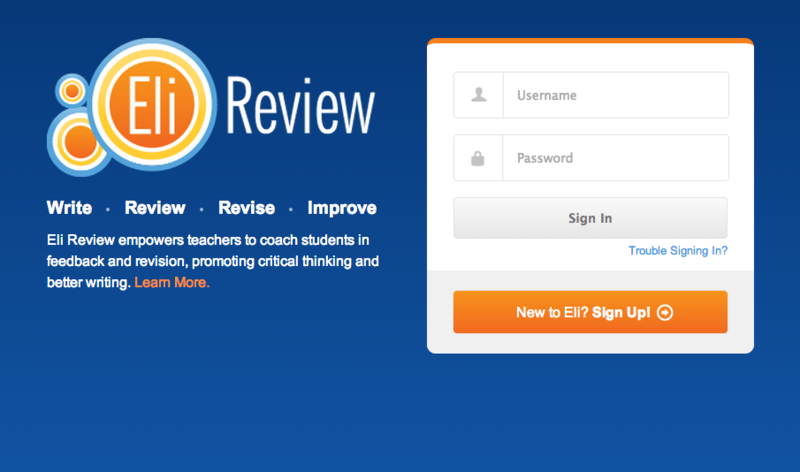 For teachers new to Eli, we hope this is the year that you try Eli Review in your own classroom. Please contact us to talk about how Eli can help you help your students. For returning teachers, we truly appreciate the support and love the feedback you give us all year long! Reflecting on 2014: Eli Review’s Year in Review was published to the Eli Review Blog in the category Uncategorized.